Aisling does not know where her unquestionable belief in her birthing body arose from. This book is based on her own births and her experience as a Bio Energy therapist, working with the body’s energetic structure to positively influence the physical body. 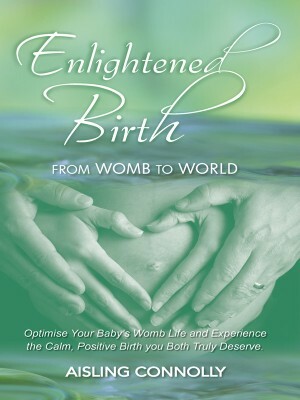 When Aisling started writing this book, she started to thoroughly search for scientific and clinical backing to what she instinctively felt and knew, both as a mother and as a bio energy therapist; the importance of creating a nurturing womb for babies and experiencing a calm birth, free of trauma for both mother and baby. Today more than ever, we fully realise just how important and influential womb life and birth experience is at shaping our babies future – both physically and emotionally. Enlightened Birth offers the amazing opportunity of becoming a conscious parent and giving your baby the ultimate head start in life. The book and CD program will guide you lovingly through pregnancy and birth, empowering you with the following knowledge. An in-depth understanding of how the birthing body works, making it clear just how possible and realistic it is to experience a calm, enlightened birth. Powerful and effective breathing, relaxation and visualisation techniques which will support you through pregnancy, birth and the early weeks of motherhood.